That’s how I’d describe most Karate people when they get thrown to the ground. (I know, because I used to be one of them.) Why? Because sadly, many Karate schools don’t teach reality-based self-defense tactics. And reality, by its pure definition, will always involve an element of ground fighting; whether it’s you lying on the ground, or your opponent. 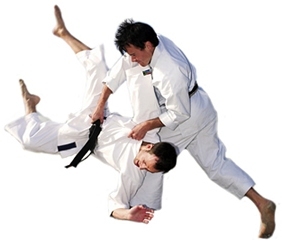 Hence, if you don’t know the very basics of ne-waza (ground techniques), you’ll never be fully capable of handling the inherently unpredictable nature of a physical encounter – along with the unique demands it places on you in terms of physical stress, tactical skills and situational awareness. In other words, the ground is a dark and evil place. So don’t make the mistake of not practicing for it. Brazilian Jiu-jitsu (BJJ) legend Rickson Gracie probably said it the best: ”I am a shark, the ground is my ocean and most people can’t even swim.” – Rickson Gracie. Amen.